Starting at the southwestern edge of Zilker Park, the Barton Creek Greenbelt winds through 800 acres of minimally developed land. See this map for other access points. 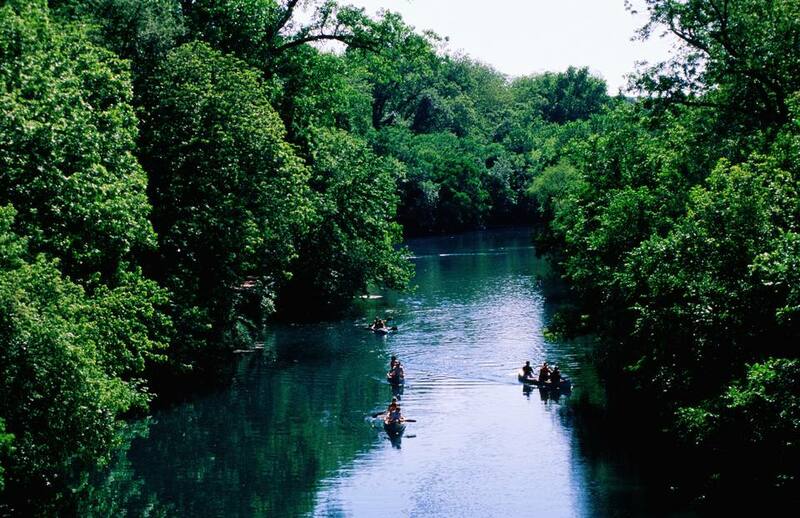 The eight miles of rocky trails crisscross Barton Creek and lead to a number of swimming holes and rock climbing sites. The trail ends in west Austin at a steep hill known as the Hill of Life. The swimming holes along the trail come and go with the rains. After heavy rains, the currents can be fast and dangerous. You can check the City of Austin website to find out which parks are closed after inclement weather. There are no lifeguards on duty, and it isn’t easy for emergency personnel to access these spots, so make sure you exercise plenty of caution if you decide to swim. In fact, a first responder died in 2015 after she fell from a helicopter while attempting a rescue along the trail. Cell phones don’t always work in the valleys along the trail. Make sure someone knows where you are and when you are supposed to get home. With so little supervision, there is occasionally underage drinking in the more remote areas. If you bring the kids, they may see behavior you don’t want them to see and, in fact, there may be behavior the adults don’t want to see either. You’ve been warned. In some sections, cyclists have their own trails, but hikers and bikers share the same space in some portions of the greenbelt. Whether you’re a hiker or a biker, be mindful of others, particularly along the narrow segments of the trail. Also, though dogs are supposed to be on leash, they often aren’t, so be on the lookout for dogs that may suddenly appear out of nowhere. Though most trails are well marked, it can be easy to get turned around since much of the landscape looks the same. Don’t be afraid to ask for directions before you walk miles and miles in the wrong direction (yes, I’m speaking from experience). Fatigue can interfere with your sense of direction and common sense in general. Some of the terrain is shaded, but most of it isn’t. Make sure you wear sunscreen and a wide-brimmed hat, ideally one that also covers your neck. In some parts of the trail, you can see the mansions of Austin’s rich and famous on the limestone cliffs above. Cliffs and boulders along the trail come in a variety of shapes and sizes. Beginners and experts alike can find something to climb on. However, if you’re a beginner, it’s a good idea to visit with an organized group, such as the Central Texas Mountaineers. There are no bathrooms on the trail itself. There are restrooms at Zilker Park at the easternmost entry point and at the Spyglass trailhead. Bring plenty of water; there are no fountains along the trail. Don’t drink from the creek.